With internet censorship increasing these days, you might have already discovered the accompanying problems if you travel frequently. Some website/service might be blocked in some place and it can create a lot of inconveniences. Having a proper VPN on your Windows PC is a must. Even from the security perspective, VPN guards you against unknown or unauthorized networks that you might connect to. 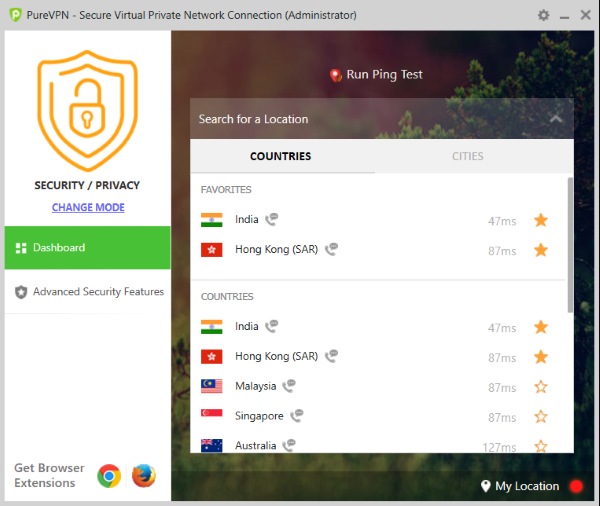 In this post, we’ve reviewed a great all-in-one VPN software for Windows called ‘PureVPN’. As the name suggests, the tool is really a pure VPN software. With its servers spread over the entire globe, PureVPN provides a seamless interruption free unlimited VPN service to its users. It is easy to use and configure on Windows. Apart from VPN services, the tool also offers security and privacy features which are much needed in today’s world. 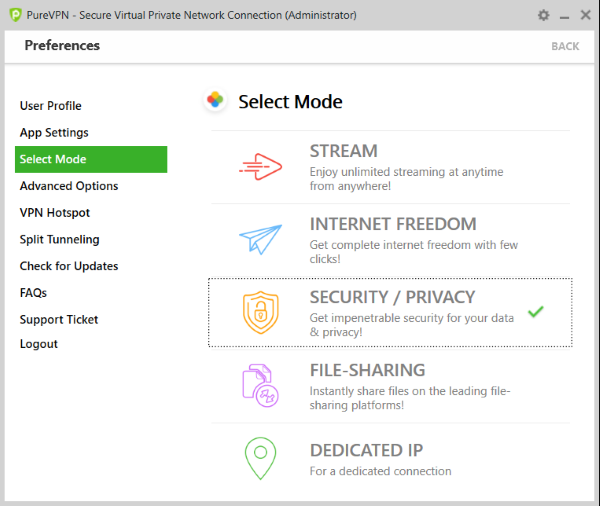 PureVPN offers some great features that are not usually available in other VPN software. PureVPN can run in five different modes. Depending on the content you want to browse, you can choose an appropriate mode and enjoy direct access to it. Here are the modes offered by PureVPN. Enable this mode if you are going to use VPN primarily to stream content from websites that might be blocked in the country you are currently in. Now in the next step, you can select a server based on your location or the website/service that you want to stream. PureVPN has special servers if you want to stream from Hulu, Netflix or similar other services. The tool also comes with a specially optimized server for Chinese users. Select this mode if you aim to unblock some websites that have been blocked in your country. This mode is somewhat like the previous one, but this is purposed to unblock websites. This mode is aimed to provide you a connection to VPN with most secure settings and environment. Very similarly, you can select the location of the server to which you want to connect. Also, to know which server is best for you, you can run a ping test. Ping test will calculate the response time from your location to servers in different locations in this world so that you can choose a better server. This mode comes with special Advanced Security Features that can enhance protection on your computer. You can enable ‘Antivirus’ that will scan the incoming data at the server level and will prevent any malicious files from reaching your computer. Content Filtering can block ads and other relevant content from reaching your computer. URL Filtering and App Filtering, lets you configure your settings to block or allow a particular set of websites from accessing internet or VPN Services. PureVPN also offers IDS/IPS detection and protection against intruders. Select this mode if you want to share a file over a P2P service, that might be blocked in your region. PureVPN will display only those servers that support P2P file sharing. Dedicated IP mode establishes a dedicated direct connection between your computer and the VPN server that can use any service. As mentioned, PureVPN is also a security and privacy-centric tool. It offers 256 Bit AES Encryption over all the communications happening between you and the VPN. IPv6 Leak Protection feature does not let any traffic pass via IPv6 to enhance security. The tool also comes with a nifty notification feature that alerts you if your computer has disconnected from VPN. This is a good security feature and ensures that you are always connected and secure. There might be some scenarios where you want to use VPN on selected applications. Split Tunnelling lets you achieve the same. You can enable this feature if you want VPN access on selected applications. All you need to do is browse for EXE files you want to activate VPN on and that is it. You can remove applications from Split Tunnelling at any point in time. This is one of the best features of PureVPN that lets you convert your PC into a VPN Hotspot. It creates a secure hotspot to which you can connect all your other devices. You need to follow the on-screen instructions to setup VPN Hotspot on your computer. Once established, you can configure hotspot SSID and password. This is another privacy and security-centric feature that ensures that you are never disconnected from VPN. If active, Kill Switch will automatically stop internet if VPN has disconnected somehow for whatever reasons. This feature prevents data leaks in the window opened by VPN disconnections. Additionally, you can enable ‘Auto Redial’ that will attempt to reconnect to the VPN Server on disconnection. PureVPN has dedicated extensions for Chrome and Firefox. You can install the extensions to directly connect to servers from within your browser. 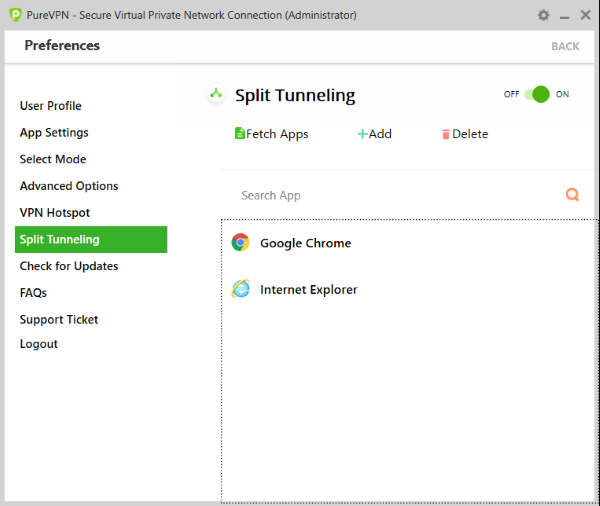 Extensions make it simpler to connect to VPN and also eliminates the need to open the Windows application. 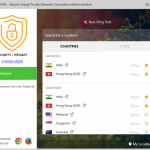 PureVPN is a great VPN tool that covers almost all the aspects and features of a genuine VPN software. It offers unlimited access, a strong network of 500+ Servers in 121 Countries and a reliable application. The additional features along with the VPN makes the tool more useful in general. PureVPN can cost you as low as $2.91 per month if you purchase the two-year plan. The amount you pay is completely justified by the services offered by this tool. Moreover, PureVPN supports 5 simultaneous logins on one account. You can buy this VPN software from PureVPN.com. Great content on this website. Thanks a lot windows club. How does not letting any traffic pass via IPv6 enhance security? The problem is the VPN does not provide IPv6 connectivity in dual-stack along with IPv4. Black-holing the IPv6 plugs the leak but doesn’t provide access to the IPv6 Internet. Nice post TWC. keep it up man. just one question, are they offering deals on this black friday like ivacy is (3 yrs for like 45 bucks) or something similar? What is the difference between the modes? Is streaming mode not secure ans private? and can’t you stream in in file transfer mode?